Main Setlist: Caroline, The Wanderer, Rain, Don't drive My Car, Mean Girl, Softer Ride, Hold You Back, Beginning of The End, Proposin' Medley, Big Fat Mama, Pictures Of Matchstick Men, Ice In The Sun, The Oriental, Creepin' Up On You, Living On An Island, In The Army Now, Drum Solo Matt, Roll over lay Down, Down Down, Whatever You Want, Rockin'all over the World, Paper Plane, Junior's Wailing, Rock'n Roll Music / Bye Bye Johnny. 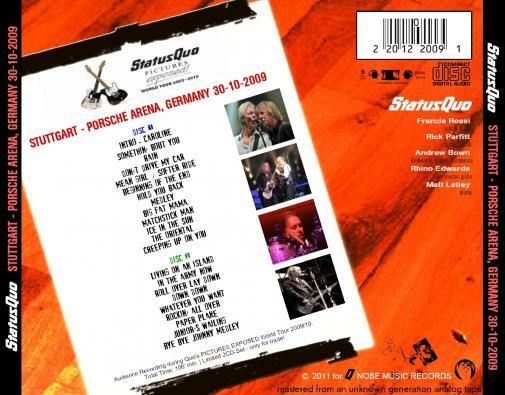 Additional song performed: Little Lady, Break The Rules and Don't waste My Time (only in Paris 2009) plus Burning Bridges on the UK Arena leg. Tour Note: 9 shows were cancelled in November 2009 due to Francis Rossi's illness but only 5 rescheduled shows in early 2010 were played due to Andy's and Rick's illness. 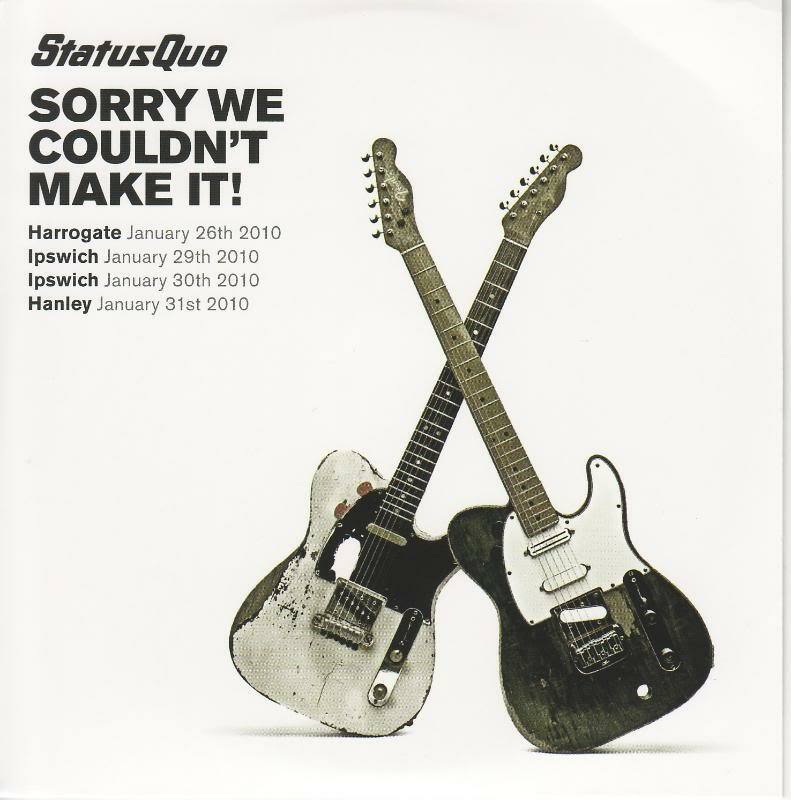 26.1.2010 - the second night of rescheduled gigs at Harrogate on January 26th was cancelled at very short notice. 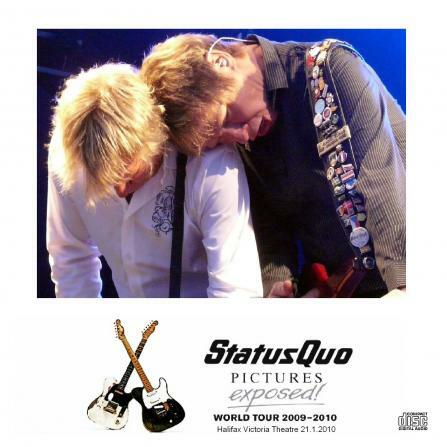 The following press release appeared on Quo's website: "Quo were forced to cancel their concert scheduled for Tuesday 26th January at the Harrogate International Centre due to illness. Keyboard player Andrew Bown was struck down by the Winter vomiting virus. Andrew first began feeling unwell at the venue around 17:30 but hoped to continue, however, by around 19:45 it was painfully obvious that there was no chance that he would be able to leave the dressing room, let alone perform." 29.1.2010 - the last three rescheduled gigs (two at Ipswich and one at Stoke-on-Trent) were cancelled due to Rick being ill. 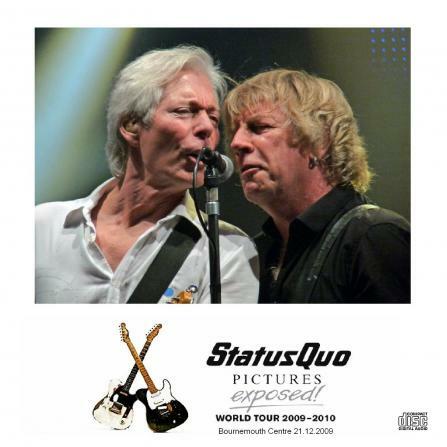 The following press release appeared on the official Quo web site. 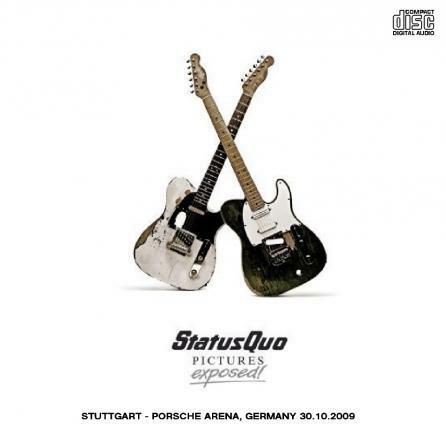 "Quo have been forced to cancel three sell-out concerts due to illness. 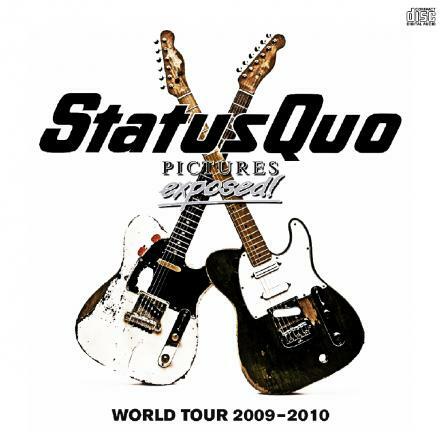 Rick Parfitt has been diagnosed as suffering from upper respiratory tract infection. 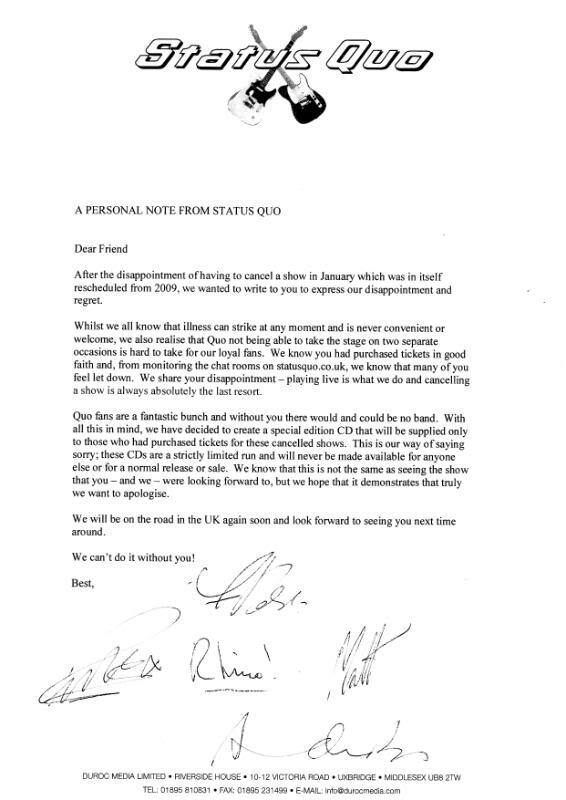 The band bitterly regret having to take this course of action and apologise to all fans affected, but there was no alternative. 16.4.2010 - following the Iceland volcano eruption that disrupted all of Europe's airspace in mid-April, Quo were left stranded in Moscow after their gig on the 15th April. The following article appeared in the UK's Daily Mirror newspaper on April 19th, entitled "Iceland volcano: Status Quo stranded in Moscow". 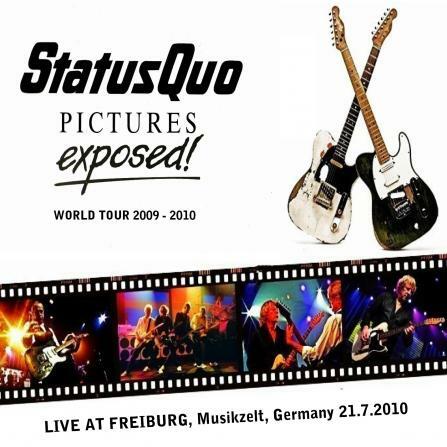 "Rock veterans Status Quo are stranded in Moscow - and face a lengthy rail and road slog to get home as a result of the air travel crisis. The group played two shows in Russia last week - one in St Petersburg and the other in the capital on Thursday. "Over the next few days, our tour manager tried everything to get the band and the crew back, booking and re-booking flight after flight - to Madrid, Helsinki, Hamburg and Cologne - only for them all to be pulled at the last minute. "We'd been through a similar thing in 2004 when our tour bus got caught up in the French ports blockade but this was much worse. We had to be ready to travel at a moment's notice so our bags were permanently packed. "When it looked like the idea of a flight was a non-starter, we tried to organise train travel to Germany. That didn't work out so then we tried booking travel to Warsaw via Belarus, in the hope that our tour bus could come out from London and pick us up there. But everything we tried hit a brick wall." By the time they'd languished in Moscow over the weekend and into the early part of this week, a new and more pressing problem began to present itself - the visas that the band and their crew had been given were due to run out, meaning they'd be stuck indefinitely. "By that point," recalls Francis, "things were beginning to feel a bit desperate." After a nerve-wracking SIX DAYS, the band finally made their escape in a bizarre case of history repeating itself. 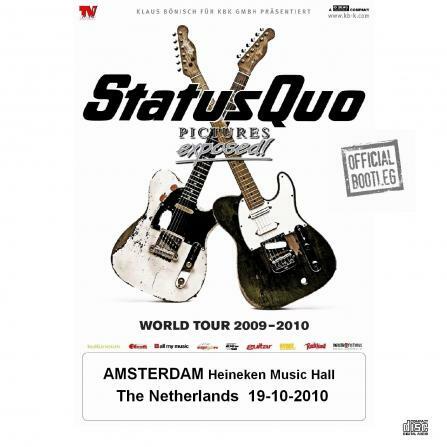 Back in 1979, not long after Quo conquered the charts again with Whatever You Want, Rick found himself stuck at Amsterdam airport. Needing to get to Dublin for a writing session with Francis, and with the day's flights fully booked, the flash rocker simply splashed out 3000 pounds on a PRIVATE JET. So when the first available jet touched down at Moscow airport before a return flight to Stuttgart, Quo's backroom team sprang into action. They chartered the plane, crammed the band and crew on board and booked a tour bus to meet them in Germany. 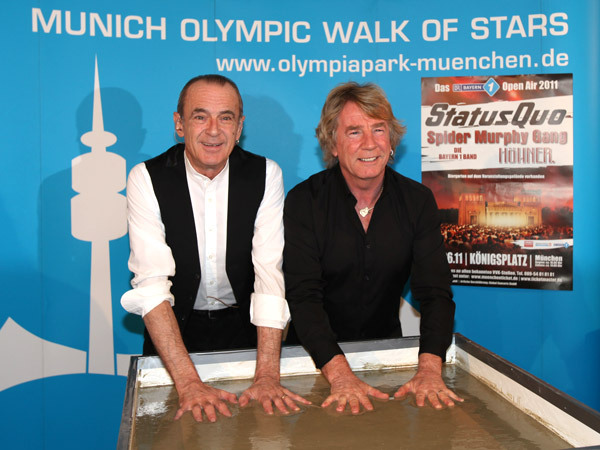 "I was so happy to see Stuttgart that I KISSED the ground," says Francis. "It was a real relief to finally be on the way home." 1.5.2010 - Quo were due to headline the Rock For Life Festival near Inverness, Scotland. The following press release from April 22nd, however, indicated the reasons for the cancellation of the entire festival. "Caledonian Productions have announced the cancellation of the 'Rock4Life' event on 1st and 2nd May 2010, which was to be held at Whiteness by Ardersier. 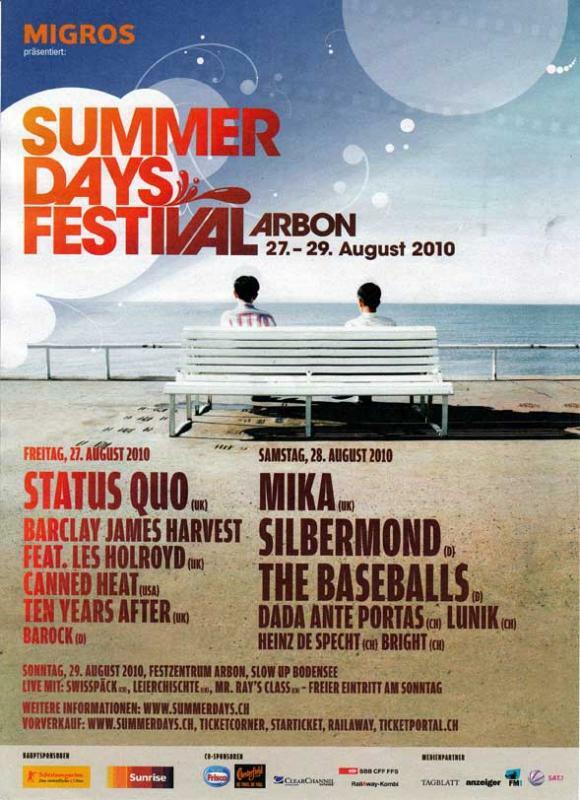 The promoters have cited that due to a lack of interest generated by the second day (which was cancelled recently and was to feature McFly and the Sugababes), both the overall production costs for the entire weekend and lack of ticket sales for the Sunday unfortunately had a knock-on effect for day one, which was to feature Status Quo as the headline act. 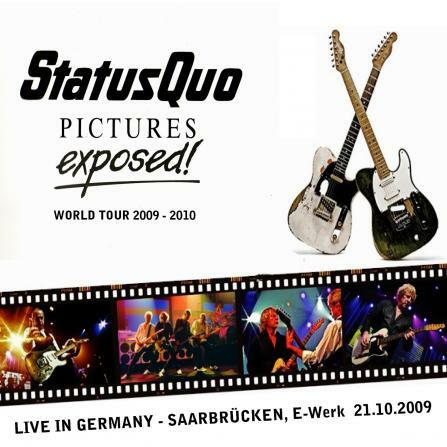 Sales for Status Quo were meeting expectations and continued to sell well every day in the lead up to the event, however, due to contractual tie-ups with suppliers, the overheads related to the two day event combined with a serious cash-flow situation left Caledonian Productions only one option which was to cancel the entire event. A spokesperson for one of the acts commented, "It is unfortunate that the concert has been cancelled especially with Highland Hospice being a beneficiary. To have this outcome is very sad. On reflection, it would appear that parts of the event has been ill considered." 6.5.2010 - the band performed at the "Walking All Over The World" charity event, Dorchester Hotel, London, on May 6th. The event was organized as a salute to Sir Ian Botham and his 25 years of Leukaemia Research walks. Piers Morgan hosted celebrity memories of walking with Sir Ian, along with master of ceremonies, Rory Bremner. 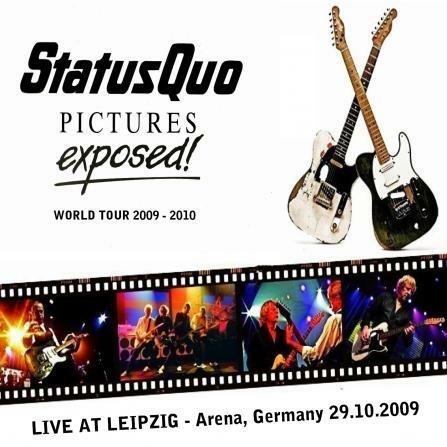 In addition to Quo, "Rick Parfitt Jnr & The RPJ Rock Band" were also in action on the same bill! 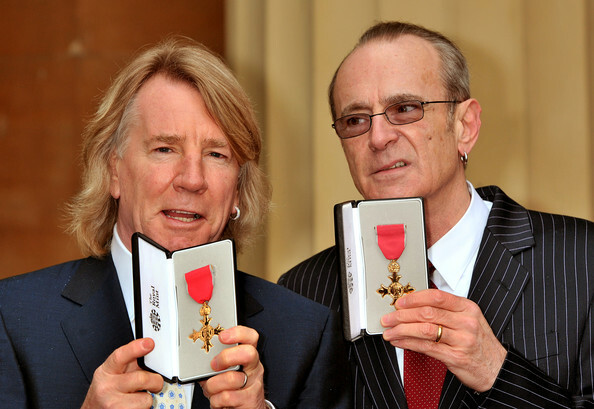 23.9.2010 - the Variety Club announced that they were holding a tribute lunch to honour Quo's 45 years in the business as well as their contribution to charity at the Dorchester Hotel on Park Lane, London. The lunch itself was splendid fare and there was always something happening on stage, especially between courses. 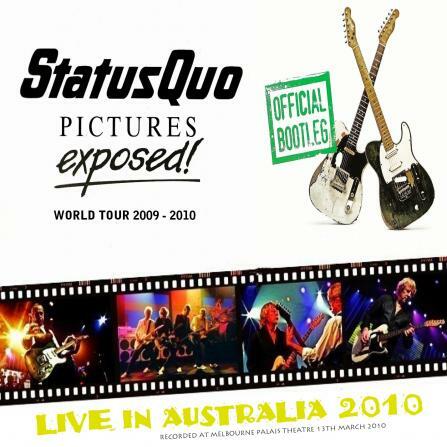 The tribute lunch auction raised plenty of money and the two Quo-related items up for grabs went to high bids (a signed white Telecaster and the chance to be "Roadie for the Day". The "In The Army Now (2010)" video was aired for the first time and received a great reception from this audience, which numbered in excess of 300 by the time all had arrived. 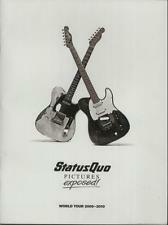 Tributes to Quo came thick and fast. From within the room, Jilly Johnson, Ed Stewert, Nick Owen, Bill Wyman and Paul Gambaccini all had nice things to say, whilst recorded messages included those from Richard Hammond and Eddie Jordan. There were many other famous faces around the room including Pip Williams, Simon Bates, Vanessa Feltz, Tony Hadley, Roger Taylor and John Altman. 25.9.2010 - Quo appeared at Rhythm Force 2010, Kneller Hall, Royal Military College of Music, Twickenham, UK with Francis sporting a fleece top to protect himself from the chill wind blowing across the stage. At the first talk break, he mentioned the cold and also talked about the reasons for them being there, resulting in a great reaction from the crowd. The set was the standard one-hour festival fare, but for a rather special rendition of "In The Army Now". Francis had a lyric sheet to work from for the new words, a sergeant appeared for the "Stand Up and Fight" line, and a military choir appeared behind the low end of the "wall of death" for the closing choruses of the new version - what a great performance of this song and, again, a real favourite for this crowd. All of the band seemed up for the gig and delighted the large crowd, with massive singalongs for the big songs and a rousing "Rockin' All Over The World" finale. This was a top effort from the band for a "no fee" gig, the light show was also worthy of special mention.